Browse > Home / Burien News, Headlines, Life, Science, Weather / Puget Sound Weather Geek: Sunday’s day-long downpour; what happened?! 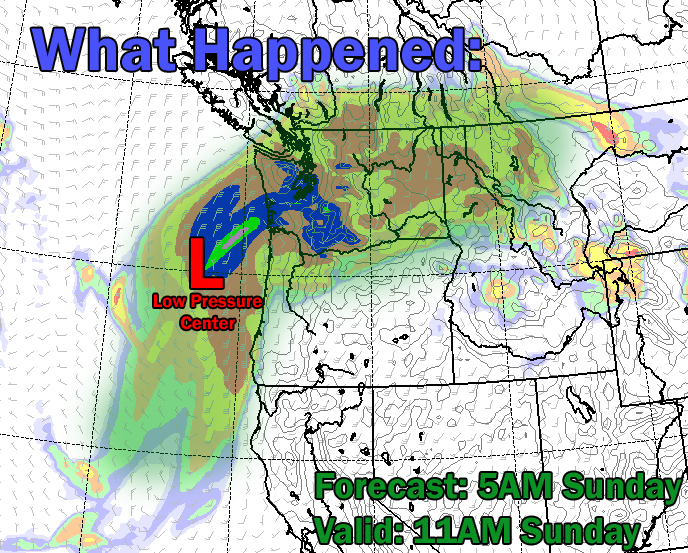 Puget Sound Weather Geek: Sunday’s day-long downpour; what happened?! This last weekend I took a mini-vacation to Vancouver BC, and was unable to update the blog. Upon my departure, the weather in Seattle was forecast to be rainy on Saturday, with a transition period on Sunday; a reasonably straightforward situation that we’ve seen numerous times this season, or so I thought. When I checked the radar on Sunday, it became obvious that Mother Nature had thrown a curve-ball at the Northwest, and even the forecasters had been duped. By the end of the day on Sunday, the rain totals at Sea-Tac Airport topped out at 2.20″ which broke the previous record for March 15th (1.20″) back in 1972. Some information in this post references information used by UW Professor Cliff Mass’ in his blog about the event. Check out his summary! There were a combination of factors that came into play that made this rain event particularly impactful and unpredictable. The weather models run on Friday were certain that an atmospheric river (a river of suspended water transported over thousands of miles, usually from sub-tropical regions) would form over the weekend and drop rain in the Northwest. What the weather models had a tougher time figuring out was how the embedded surface low pressure (circulating area of low pressure at the surface which usually causes strong winds in their paths) was going to behave. On Friday, the forecast models predicted the low pressure to hit central/southern Oregon with moderate rain and winds; nothing extraordinary. 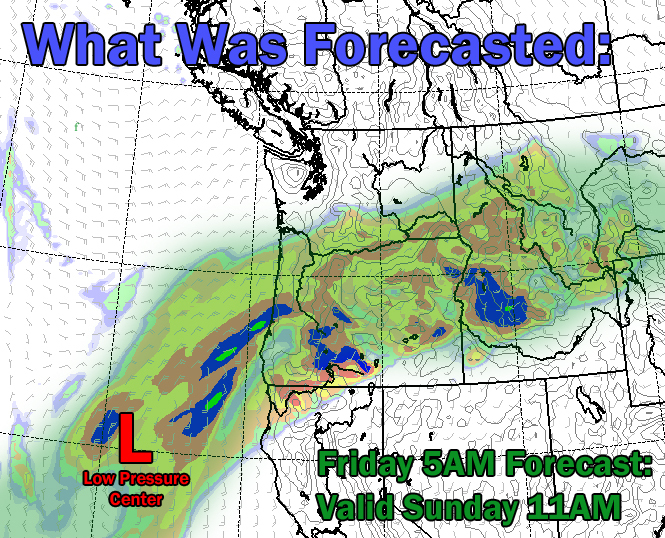 However, what actually happened on Sunday was vastly different from Friday’s forecast. The low pressure system, combined with the atmospheric river strengthened significantly, and smacked into western Washington, and Oregon hard. Rain poured relentlessly for nearly ten hours, while the low pressure pounded Portland and other areas with damaging high winds. As if this wasn’t overwhelming enough, an epic 19″ of snow fell on Hurricane Ridge in the Olympic Peninsula in 24 hours. In conclusion, this event highlights the weaknesses that are involved in current weather forecasting. There are many situations that the weather models handle very well, but we must be wary of the vulnerabilities of the current computer systems, and observation data. The atmosphere is a very delicate and complex system, and the best thing humans can do in these situations is to learn from our mistakes and improve the art and science of forecasting. Looking ahead, a mixed variety bag of weather is in the works for the region. A weak system is traversing through with clouds and a few spot showers on Tuesday, setting up for a pleasant transitional period on Wednesday with highs in the 60s. Rain returns on Thursday as we tap into another little atmospheric river and gear up for a rainy Friday and a showery Saturday. Clearing is expected by Sunday. Enjoy your week, and happy St. Patricks Day!